If a property has failed percolation testing, can you still "engineer" a septic system? Actually, no. In most counties in California, you are required to have a minimum of 24” of suitable soil prior to encountering a limiting condition in order to even have an above ground mound system designed. What is a "limiting condition?" A limiting condition could be poor soil such as clay, a high groundwater table, or too much rock (greater than 50% rock to soil ratio). What is the difference between wet weather perc testing and wet weather ground water monitoring? In some counties, both of the above are required. Both wet weather percolation testing and wet weather groundwater monitoring are conducted during the same time of year. However, wet weather percolation testing is conducted on properties where the soil has a high clay content and thus a high potential for shrink/swell in the soil. Wet weather ground water monitoring is conducted on properties that show evidence of potential high ground water via soil mottling. In Sonoma County, for example, all properties that are less than 5% slope require wet weather ground water monitoring, but do not necessarily require wet weather percolation testing. Do projects always require grading permits? In general, if you are making excavations exceeding 3 feet, fills exceeding 1 foot, and more than 50 cubic yards is involved, then a grading permit is required. However, regulations do vary in different jurisdictions. For example, in many counties, septic permits include grading and erosion control measures (wastewater ponds excluded). You may not be required to pull a separate grading permit, even if your septic system construction project involves any of the above described grading. Besides a grading permit, are there any other permits my project would be subject to? If your project disturbs 1 or more acres of soil, or your project disturbs less than 1 acre but is part of a larger common plan of development that in total disturbs 1 or more acres of soil, you will be required to submit a Construction Storm Water Notice of Intent. 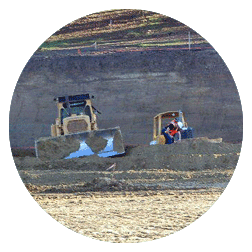 Construction activity that falls under this General Permit for Discharges of Storm Water includes clearing, grading, and disturbances to the ground such as stockpiling or excavation, but does not include regular maintenance activities.